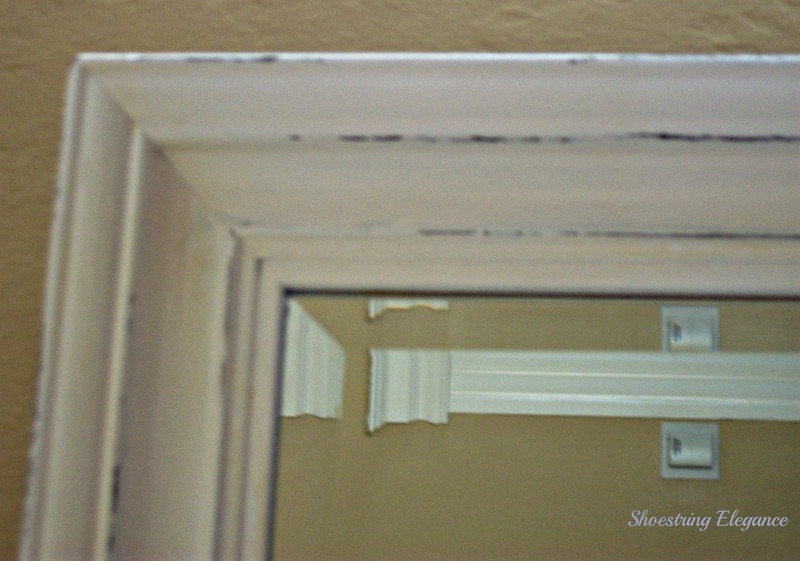 Shoestring Elegance: No COST Mirror frame redo!! It looks great. Thanks for sharing this transformation. Bless you! Thank you, Gail, and Thank you for the Blessings!! I'll take all of those I can get! You did an amazing job on this, it looks so great and the pictures are perfect! I love the detail. Thanks so much, Diane!!! I don't know about the pictures, but I appreciate how very you and your words are!! Hugs, ~Theresa. Happy Birthday to your dad! 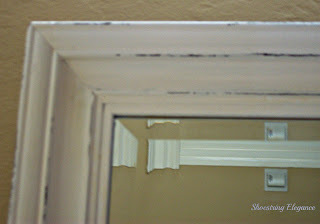 Great job on the mirror frame. 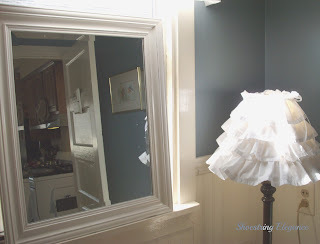 I love mirrors, and that ruffled lamp shade is so pretty! Thanks so much, Angie!!! Sorry for the delayed response, and I think its is safe to say my Dad had a very Happy Birthday!! It was a GREAT day!! Oh and i feel so bad because it was my oldest sister's bday, too, and I only said My Dad. SO Happy Birthday, Kathy!!! Thank you, Kathy!!! Happy Birthday!! Virginia, what a beautiful comment! Thank you so very much. Your mirror is lovely and I know how difficult it is the photograph mirrors without getting yourself in it. The lamp is darling! Thanks for sharing. Thank you so much for your kind words, Sandi!! 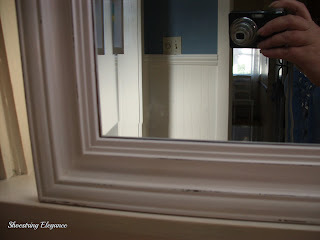 You did a great job on the mirror. How fun that you got to snag if from your neighbor. All the better! I found you at Stringtown Home. Thanks Liz!! It was such fun! I stopped over to say "Hi" because his Mom had been in the hospital and he literally was on the way to the garbage with it and all I could see was how good it would look when I finished it!!! Thanks for stopping by! ~Theresa. Great job lady..This is all so much fun isnt it! Yeah, It's a BLAST!!! Thanks for hosting today and checking it out! What a great job. Lovely. I hope you'll visit me at My Dream Canvas! Thanks for the invite Tamara!! 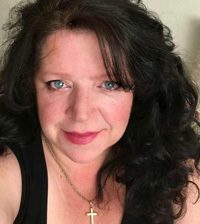 Loved your blog! Thank you !! And thanks for the party!! That's an awesome outcome! You did a great job, girl! Amazing. I'm so glad you liked it! Thanks so much for coming by! Thanks so much, Holly!! I'll get hooked up with you on Monday, My Dear!! Beautiful job! 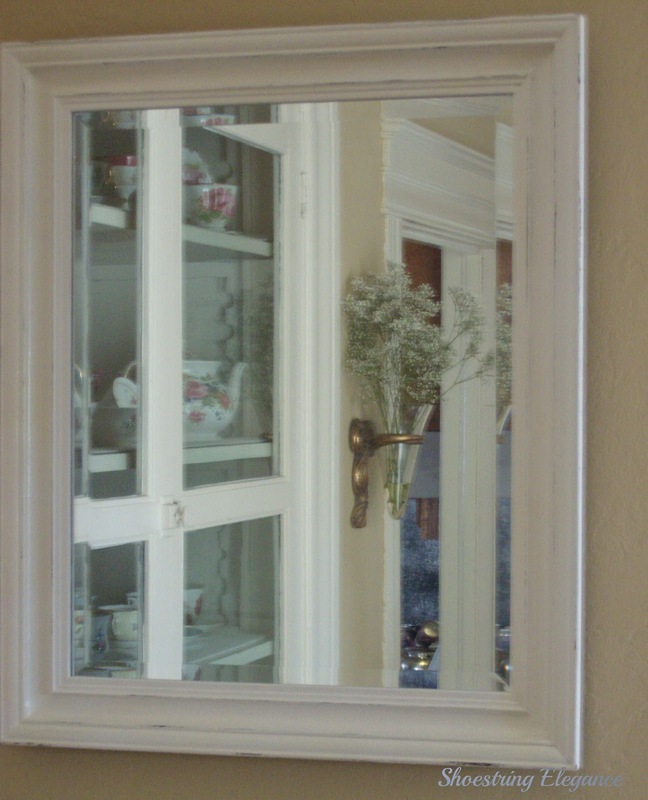 Love how the mirror turned out. Thanks for sharing on Simple & Sweet Fridays! Thank you both, Katie and Jody for letting me share on your beautiful blogs! !